At the top, you have the option to change the date to view games from previous days and seasons and a link that will take you to the season stats of the day’s starters once they are announced and set. Below that, we have some very basic information about each game that is active. You can view the win probability graph and leverage index of each game that has started or finished with the option to click on the game to see more (which we’ll do in a moment). This box shows the lineup for each team and displays our Game Odds. 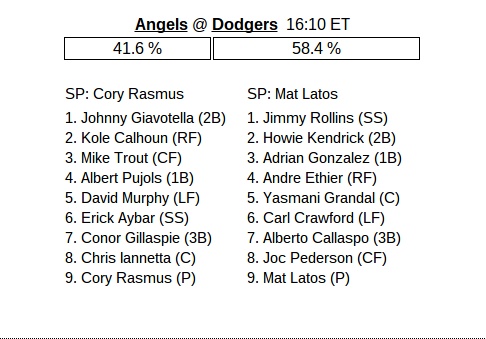 The Game Odds is our model’s prediction about the chance each team has to win the game based on the quality of the starting pitchers and lineups, plus home field advantage. The numbers are probably a little overly precise, but they are a fun tool for you to get a sense of which team is stronger according to their projected talent level. If we click on an active game, we have plenty more to explore. There are four tabs at the top of any individual game. The first is Scoreboard, which takes you back to the full grid, followed by Game Graphs, Play Log, and Box Score. We’ll start with Game Graphs. On this page, there are five basic things to pay attention to. First, we have the win probability graph for that game. This chart is embeddable/downloadable and is updated after each play. 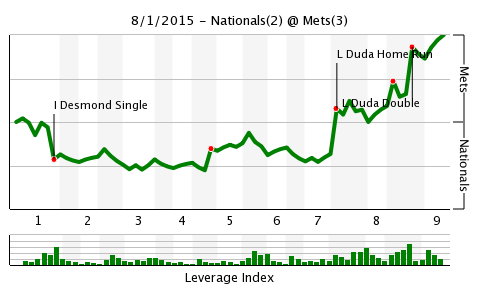 If you hover over any part of the graph you can see the exact moment and the team’s odds of winning based on the inning, score, and base-out stat. We use shading to separate innings for easier viewing as well. The green line is the live win probability based on two average teams, which the gray line is the same pattern adjusted for the pregame Game Odds. Below that is a bar graph to show the leverage index at each point in the game as well. The bar will turn red for especially big moments. On the right, you’ll see the current pitch location chart for the game and whether a pitch was called a ball, strike, or swung at. This offers a view of the strike zone for that day. Below the graph is a summary of the last few plays, then below that is a basic box score, and off to the right of that is a quick summary of the status of the other active games. Next up, we have the Play Log. Here you can see the pitcher, batter, inning, base-out state, and score of every play. Next is a description of the play (and if you hover over, of the pitches), followed by the leverage index, run expectancy, win expectancy, win probability added, and RE24 of each play. This is also updated after every batter, although it usually isn’t instantaneous. Finally, we have the Box Score. This has the standard box score stuff like runs and such, but also includes FanGraphs type stats like wOBA and WPA. The fun part is that you can scroll down and get a huge amount of information ranging from single game ERA- to pitches seen by a batter to the leverage index when the pitcher left the game. Finally, you also might not know that on any FanGraphs leaderboard you can go to the Split drop down menu and click Live-Today or Live-Full Season to view that day’s stats for every player or every player’s season stats with the current day included. You can use this split in conjunction with all of the other leaderboard features. Coming to FanGraphs probably isn’t the easiest way to check the score of a random game, but if you want to really get caught up on how the game played out and how each player performed, we have some terrific tools to track how games have unfolded. And you can go all the way back to 1974! If you have questions, feel free to ask in the comments section or find me on Twitter to learn even more about live features at the site. 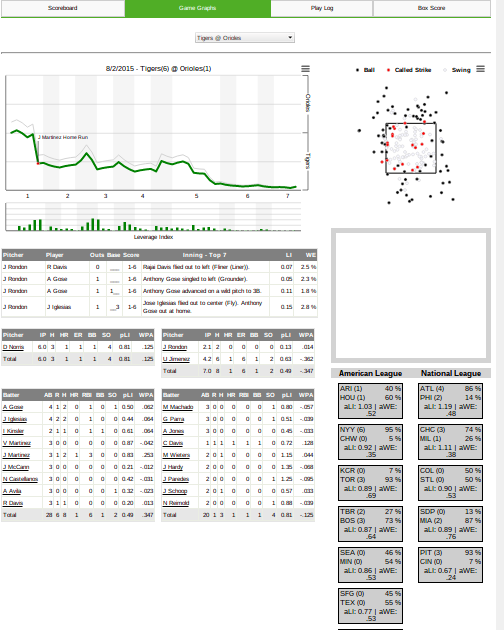 We hoped you liked reading How To Use FanGraphs: Live Scoreboard by Neil Weinberg!